Our “Admiral” ultra-luxury marine model has a 2 1/2-inch layer of plush memory foam bonded on top of a 5 1/2-inch base of our premium high density and resilient polyurethane foam. It’s intended for discriminating boat owners, looking for the ultimate in comfort for themselves and their guests. Our sleep engineers, foam specialists, and slumber-technicians have determined that memory foam alone doesn’t give sufficient sleep support, because it just keeps molding to you as you sink deeper into it. Therefore, we “back up” all of our memory foam boat mattresses with a urethane foam base for proper support. This laminated yacht mattress provides an excellent sleeping surface at 8 inches. 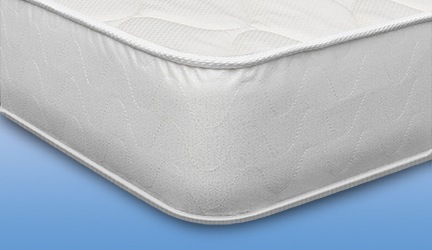 If you’re looking for a plusher top feel, this marine mattress is for you. Like all marine mattresses we sell, the Admiral’s cover is constructed so it doesn’t shift and bunch. The bottom of the cover is made from the same high-tech non-skid material as our “Commander” and “Captain” models, and the sides and sleeping surface are sewn with a tape edge using beautiful, premium, quilted damask. This is the ultimate in luxury and comfort. Optimal Support—The perfect mix! The core of our Admiral marine mattress model is made of sufficient 1.8 density foam, and then we laminate it to a plush memory foam top; which is optimal for supporting a person or persons weighing in excess of 250 lbs. 8-Inches Thick—5.5-inch base for support topped with 2.5-inch viscoelastic memory foam for comfort. This design gives you the benefits of viscoelastic memory foam without having to worry about hitting the bottom of a platform bed (the mattress base used on most boats). “Plush” and “Contouring” Top Feel—We use 2.5 inches of memory foam on top of our support core to create a softer contouring feel. If you’re looking for a boat mattress with a plusher top feel, you definitely should give consideration to the Admiral model. Motion Isolation—Minimized transference of motion when you or your partner are tossing and turning. Hardwearing and Long-Lasting—Engineered to withstand the conditions found on your vessel. Higher density leads to longer life and consistency of support, that’s why we use 1.8 high density support foam. We also prefer to do some things the old fashioned way, because we believe that it’s simply better. Over the years, the majority of mattresses made in the U.S.have been sewn. Why? Because it works and holds up well over time. 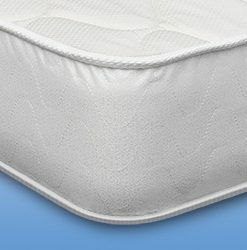 That’s why we use durable mattress ticking, (the cover of your mattress), an internal flange which keeps the cover from shifting, and a knife tape edge to close up the mattress seams. The knife tape edging means everything is meticulously sewn. We never use flimsy, easy-to-break zippers. Wow! I’m finally sleeping through the night! Thank you replacement mattress! So easy to order ! I’m so happy with our new mattresses! Excellent folks to work with and the mattress is top notch. We sleep on this mattress on our boat and it’s better than mattresses that cost us 3 times as much. Based on the people there, and the product quality, I will recommend them to my friends. Glenn… Thank you for the kind review. We appreciate the feedback and are happy to have helped! We look forward to working with your friends.